During the lifetime of a landlord’s investment, a void period is inevitable and can cause a bucket load of stress and worry. Not only will there be no rental income but you could still be paying costs such as a mortgage or council tax. Tenants circumstances change and can’t always be avoided but there are ways to keep tenants for longer and reduce the risk of a void period. Our Landlord advice and tips to reduce the risk of void periods on your investment property. Is there an underlying reason why no one wants to rent your property? Take an objective look around the rooms, is it in a clean and liveable condition. Bathrooms and kitchens are always key areas of any property, maybe a quick makeover could attract new tenants? Use a void period to invest in your property or to do essential maintenance work. Just remember, appearance matters so make your property the best that it could be! As a letting agent, we ensure that you don’t need to worry about marketing your property, unlike a private landlord. We’ll ensure your property is advertised in all the right spaces such as online property portals (Rightmove, OnTheMarket.com etc.) and our very own website. Why not advertise before the property is vacant? If you’re confident it won’t need any major work once the current tenants have left then it could be a very quick move-out, move-in policy. Plus as a letting agent, we have day-to-day experience of would-be tenants calling us to register their interest in upcoming properties. Don’t overcharge tenants! As a private landlord you will have to do your research and find out the average rent for the area but as a Leicestershire letting agent, we have our own insight and can guide you with our rental valuation. 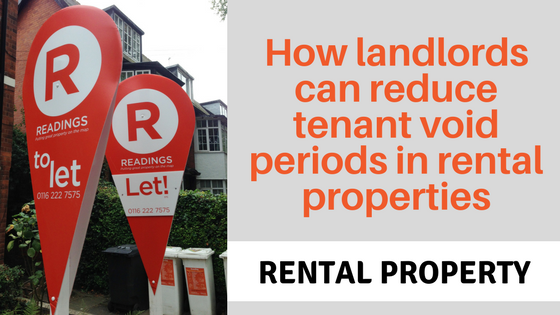 It’s finding a good balance, if you undercut average rents then this could change the type of tenant you let to. Overcharging will put prospective tenants off especially if they can find a similar property at a fair rental cost. You may want to consider including some amenities if this is an option. Finding ‘good’ tenants will always be tricky and screening checks don’t always tell the full story (they don’t tell you if a person is a party animal!). Without knowing tenants personally, it’s hard to find ones that are consistent and secure in their careers and lives, these are the best tenants. Have you ever thought of asking why tenants are moving on? It could be an easy property related fix to get them to stay. However, life happens and it’s unpredictable, circumstances can change in a second but you can try to reduce the risk. You may not want a tenant to redecorate or someone with a pet but it may be worth thinking about. A tenant with a pet is likely to be more stable and a tenant who wants to redecorate may see themselves in the property for a long time. You can always include a clause in the tenancy agreement to ensure that the property is returned to its original condition when your tenants leave. 6. How about a HMO? Is your rental property in a popular area with students or young professionals? You could consider turning your investment property into a house in multiple occupations this way, when one tenant moves out and you have a void period, you’re still making money from the other tenants. Just remember to call us to find out more about the legislation that comes with a HMO. Remember when we said appearance matters? A few extra purchases or furniture updates could make all the difference to attracting new tenants. As a letting agent we know that we offer 5* service to both landlords and tenants, you wouldn’t want us turning up late for a viewing in flip-flops and shorts, would you? We’re always professional and friendly and ensure that all parties are happy.